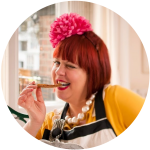 MsMarmitelover is giving a talk at The Hub, part of the London Restaurant Festival, at Covent Garden Market this evening at 6.30pm…how to start your own Underground Restaurant. I’m also doing a stall selling salsa asado, guacamole, meringues (mocha, rosewater and vanilla), home made candied peel (orange, lime, lemon), large and mini focaccia (goat cheese, olive, anchovy) and soups (French onion with cheese, Thai coconut and spinach). The teen will be there too. Oh PAH! I also saw this too late (just now in fact) and am sorry not to have come along. Next time – I'm sure there will be one. Ah wow – you make your own candied peels? That always looked like too much work! very good! Im an argentinian's fan of the underground restaurant, and want to do the same here in the place I live. Congragulations, I should love to be there! Hope the talk was a success? And I love the look of those silver ball-decorated meringues!